Chef Bigger's team uses an old walk-in refrigerator as their cheese cave, insuring the temperature is ideal for aging the cheeses and complying with the stringent regulations that insure Chestnut Provision's products are safe and healthy. But the chef assured me that one can make a great soft goat cheese at home, too, and has shared the recipe with me so you can try it at home yourself. My advice is to visit Chicago for an amazing dining experience at the Sofitel soon. 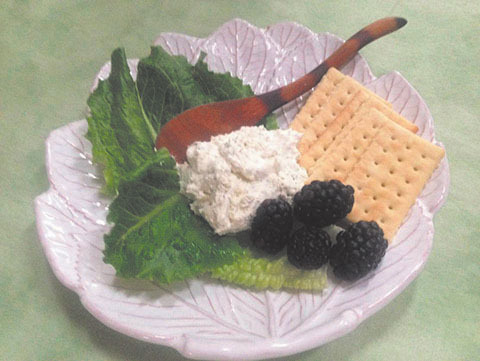 But if you can't, here is a recipe for homemade goat cheese that you can enjoy at home. Using a medium saucepan, heat the milk gradually up to 180oF as read on a instant read thermometer. Once it reaches 180oF, remove it from the heat and stir in the lemon juice. Let the mixture stand until it starts to curdle, about 20 to 30 seconds. You will see a little bit of curdling occur, slightly changing the texture of the mixture. Once that begins, get your colander lined with four to five layers of cheesecloth set into a deep bowl ready and ladle the milk mixture into the colander slowly and carefully. Once you have all the milk poured into the colander, tie the corners of the cheesecloth together and hang the whole package up above the colander. I do this using a wooden spoon across the top of the colander. Let the whey drip through the cheesecloth for about an hour and a half. At this point, the cheese inside the cloth should be ricotta like in consistency. Transfer the cheese to a bowl, add the garlic, the salt and the herbs and fold the mixture together. Cover tightly and chill in the refrigerator for an hour or so, then serve it up on crackers, bread or even in salads.